Last night, due to my interest in the round ball game, I casually followed the progress of the Australia versus Serbia friendly being held at Melbourne’s Etihad Stadium. I don’t have pay TV so I didn’t watch it, and from all reports I missed an entertaining match, despite the eventual goalless scoreline. What I didn’t see at the time, but was brought to my attention by the media this morning, was the disturbing sight of Serbian supporters choosing to use the football game as a public forum to vent their disgusting ultra-nationalist political views. 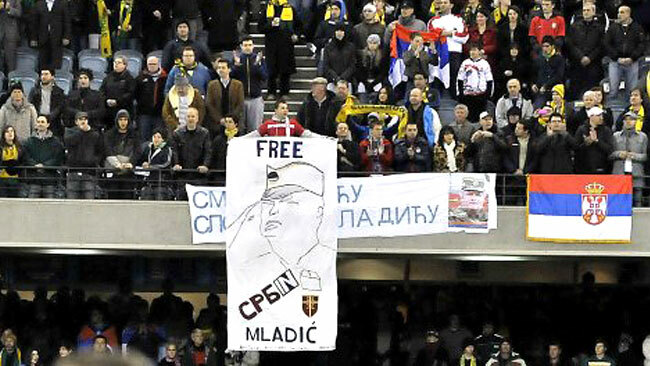 Banners expressing support for Serbian General Ratko Mladic, even calling for his release, were displayed to the horror of some of the crowd and the wider public. A brief history lesson here: General Mladic was responsible for ordering the execution of over 8,000 Bosniaks (aka Bosnian Muslims) in the massacres at Srebrenica in 1995. By execution, I don’t mean causing the death of soldiers during combat, but the capture and murder of unarmed civilians in an act that is best described as cold-blooded genocide. I unashamedly admit that my views on this debate are somewhat coloured by my Croatian heritage. My grandfather was born in what is now defined as Bosnia and Herzegovina, and until the declaration of independence by Croatia was not able to return to his homeland without fear of being taken a political prisoner by the Serb-controlled government at the time. However, even the objective observer the situation for what it is. Mladic is a war criminal, and I find the notion that anyone, Serb or otherwise, could support his actions utterly despicable. Additionally, I find the need for these people to openly express this horrific view in public at, of all places, a football game just disgusting. Sport is about many things – competition, skill, and even national pride – but not politics. If you support Mladic, while I may not agree or approve, that’s your choice. But to ruin the spectacle of an international friendly match by marching this racist political agenda out all over it detracts from the beauty that is sport. Take for instance the cricket world cup match between Pakistan and India a few weeks back. Pakistan and India hate each other – they are practically at war and political enemies, despite their neighbouring geographical locations. Yet, for the cricket match, the politics was put on hold. The Pakistani team and Indian team put their differences aside to compete in a sporting match. It was passionate, it was hard-fought, and it was a truly great sporting spectacle. It was so because the politics had been checked at the door. The Pakistanis and Indians arguably hate each other even more than the Serbs and the Bosnians/Croatians/Albanians/Macedonians/Kosovars do, but they acknowledged that their differences had no place on the sporting field. Sadly, the Serbs (and I acknowledge the Croatians too) do not take this mentality. The riots at the Australian Open tennis a few years ago show this. While we understand the hatred you both have for each other, is there any need to let it develop into a fist fight at a public sporting event? Additionally, given the age of the perpetrators at both the football and the tennis, it’s highly unlikely that any of them were even involved in the Balkans wars of the 1990s – they are most likely descendants of the generation of immigrants who left Europe in the 1950s and 60s (a bit like me). While it appals me to learn of the crimes committed in those wars, I have no desire to bring these battles to of all places a sporting event. My grandfather left Yugoslavia (as it was then) to avoid these wars – to enjoy a life of freedom instead of one of conflict. Why their descendants can’t do the same confuses and disappoints me. Take your politics somewhere else, and let sport be the great contest that it is. Wait,what’s this “round ball game” you speak of? Nil-all did you say? Sorry,I fell asleep at that.